Amazon Kindle Paperwhite is the most advanced e-reader offering a paperlike reading experience, a touch display, and weeks of battery life. It is the e-reader for the avid reader. Kindle Paperwhite features an advanced 6-inch display, built-in Wi-Fi, and millions of books available for download. Amazon Kindle Paperwhite e-reader is designed to make it easier for you to read and enjoy your books. According to Amazon, the Kindle Paperwhite e-reader offers a 6-inch Paperwhite display with 62% more pixels and 25% better contrast, delivering sharper, crispier, and darker text and images. It is a capacitive multi-touch display offering 16 shades of gray and 212 ppi. Kindle Paperwhite e-reader is designed to read just like ordinary paper. It is designed to read outdoors without glare, even under bright sunlight. At night, Kindle Paperwhite reads just fine with Amazon’s patented built-in light that illuminates just the screen and not the room. So, Paperwhite e-reader is perfect for all lighting conditions. Amazon Kindle Paperwhite gives you easy access to your e-books. You can easily access the Kindle Store wirelessly to buy books and magazines via the built-in Wi-Fi. Find millions of books to buy and Amazon will deliver them in seconds. If the Kindle Paperwhite e-reader is sold in your region you can enjoy free Wi-Fi access from a carrier. For example, in the United States, free Wi-Fi access are available at all AT&T hotspots. 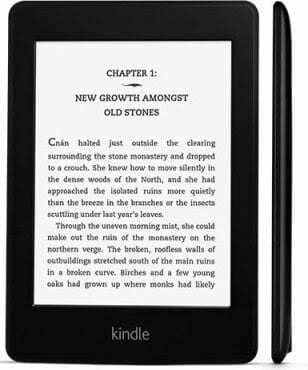 Amazon Kindle Paperwhite e-book reader comes with free unlimited cloud storage for all content bought from Amazon. You can store up to 1,100 in the built-in storage. However, every e-book you buy at the Kindle Store is backedup in the cloud so, you do not have to worry about the physical capacity of the device. This means you can access your book from anywhere through Wi-Fi. Amazon Kindle Paperwhite is currently available for pre-order at Amazon in the United States. It will go on sale in the US on October 8, 2012. The price is $119 with special offers (Ads) and $139 without special offers.